Paneer or cottage cheese is a fave with all vegetarians. 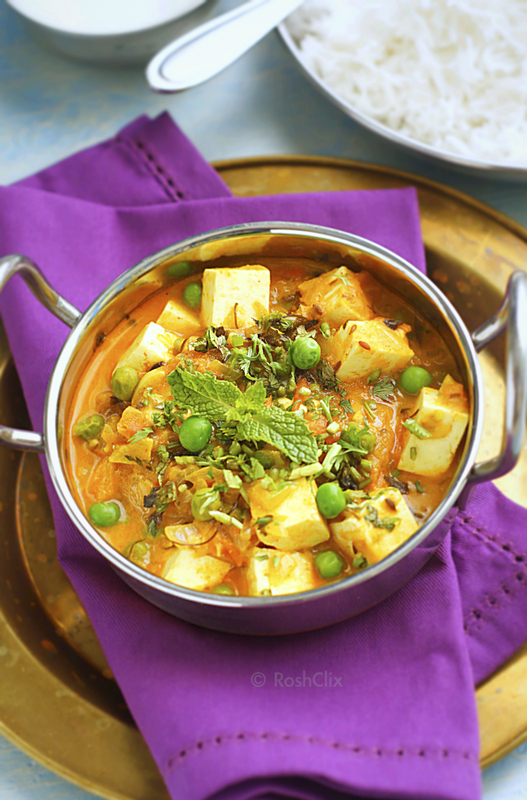 Add in few cubes and any ordinary vegetarian dish turns into something exquisite :) I have tried making fresh paneer at home. Although easy I find it bit time consuming and of course I don't have the patience to do all that prep work to cook something! But definitely fresh home made paneer tastes the best. We get fresh paneer in the stores here so I always stock up on those. Makes it lot easier. This is one of my favorite dishes. Goes well with rice as well rotis. 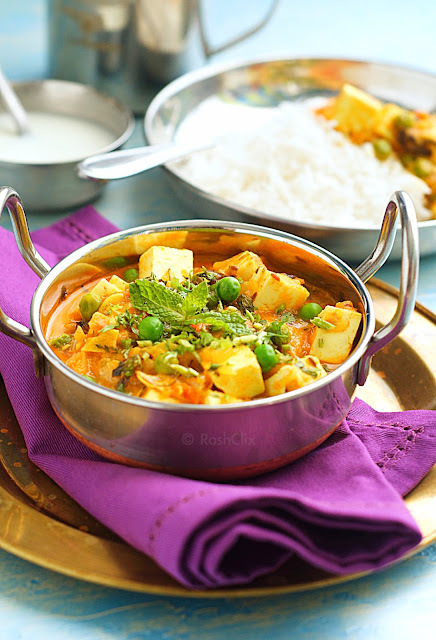 The combination of peas with the paneer is like 'made for each other' :D And it is really simple to make. You can use fresh green peas in this recipe. For that boil the fresh peas and drain. Do not discard the water. Keep it aside and you can add it to make the gravy which would make it more flavorful. If you like a smooth texture, then once the tomatoes are cooked, just before you add the spice powders, you can grind the onion tomato mixture. Add the ground paste and then proceed with the remaining steps in the recipe. Heat ghee / oil in a non stick wok or pan. Add the cumin seeds when the oil is hot. When the seeds splutter add the chopped onion, garlic, ginger and green chili. Add some salt and sauté well till they begin to brown. Add the spice powders - turmeric, red chili and garam masala. Fry for few seconds and then add the water with the green peas. Stir and cook covered on a low flame for five minutes. Then add the kasoori methi and paneer cubes. Stir through the cream. Cover and let it simmer for few minutes. Garnish with chopped cilantro and serve hot with rice or rotis. perfect to go with naan or chapathis..yummy!